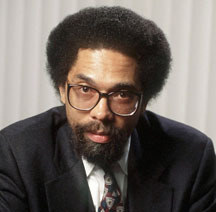 Cornel West's family moved to Sacramento, California when he was three years old. When his third grade teacher tried to force Cornel to recite the Pledge of Allegiance, he punched the pregnant woman in the face. They expelled him. "He was very violent as a young kid," explained his brother Clifton. As a high schooler, Cornel was philosophically attracted to the Black Panthers, but couldn't join due to the Panthers' insistence on atheism. Dr. West taught at Union Theological Seminary, Yale Divinity School, and the University of Paris. Next he landed a gig as professor of Religion and African-American Studies at Harvard, then Princeton. West reads biblical Hebrew and Aramaic. Somehow he got a role in both Matrix sequels.